Isn’t it funny how when you are running late, there is always a problem on the London Underground? Or maybe there are almost always problems on the Tube, but it’s just that such delays are much more noticeable when you’re in a rush. I was in a hurry to get to lunch, and readers who have read my Viet Noodle Bar post will know that when food is on the cards, I like to try and be on time, although admittedly only with varying degrees of success. Therefore, I started to fret as the train was held up first at one station, and then again at the next. “Lunch is waiting for me. Is my entire journey going to be like this?” I thought, gritting my teeth. 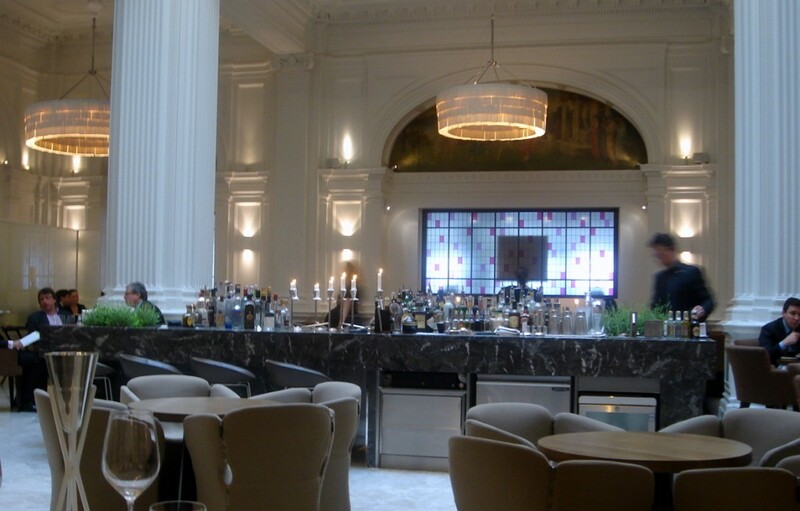 But somehow, I managed to arrive at Liverpool Street exactly 3 minutes before my lunch reservation at 1901 at Andaz. Wow, how about that for miraculous timing! I rounded the corner out of the station and saw my lunch companion (1) head into the restaurant, and (2) then come straight back out. It seems that from a distance he had spotted me and decided to wait for me outside instead. Later he would tell me he saw me out of the corner of his eye and that he recognised me from a distance by my ‘walk’. My ‘walk?’ I know a supermodel I resemble not, so what about my walk could be so memorable? Did it resemble a waddle, like the side to side action of a penguin in motion? But I did not ask. I didn’t want to. Some things in life you are just better not knowing. 1901 replaced the Aurora Restaurant (which I really liked) when the hotel (formerly known as the Great Eastern) was taken over by the Hyatt Group and re-launched as the Andaz Hotel. The Grade-II listed interior of the building dates back to 1884. The restaurant is stunning with high ceilings and is spaciously laid out to accommodate 143 covers. It exudes an exalted blend of the contemporary with the historic: marble floors, neo-classical pillars, and a dazzling stained-glass dome set into the ceiling. Much was made in the press of its multi-million pound refurbishment and opening late last year. Depending on your point of view, it was either the bravest opening of its kind or the worst timed – right at the outbreak of the recession and smack bang in the centre of the Square Mile. The menu sings of Britishness. The sourcing of the key ingredients is clearly stated next to each dish, and all are British. But in another twist, the items on the `a la carte menu are classified by price: eight, ten and twelve pound starters; seventeen, nineteen and twenty-two pound mains. Therefore, when you read down the list of mains, some meat courses will precede the fish. A confusing strategy if, like me, you usually choose by type and not necessarily by price. 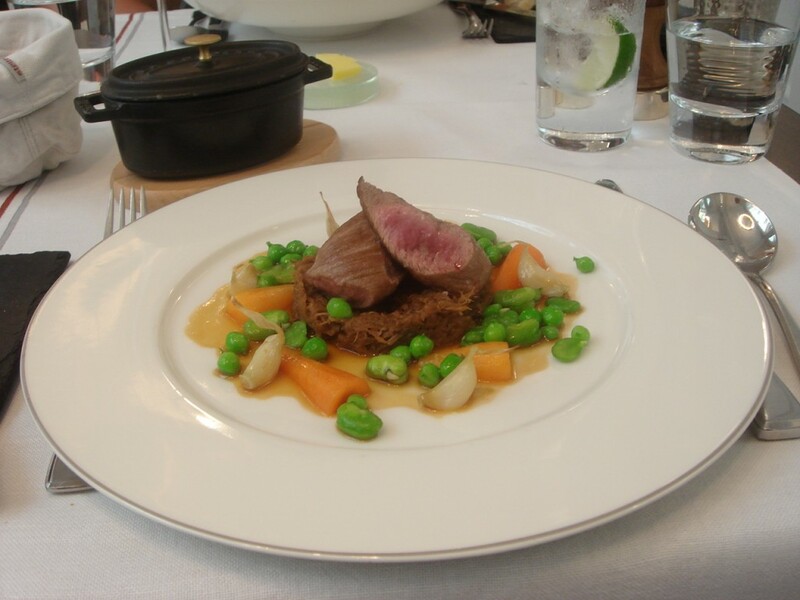 In any event, we went for the lunch menu of £25 for three courses, with three choices per course. 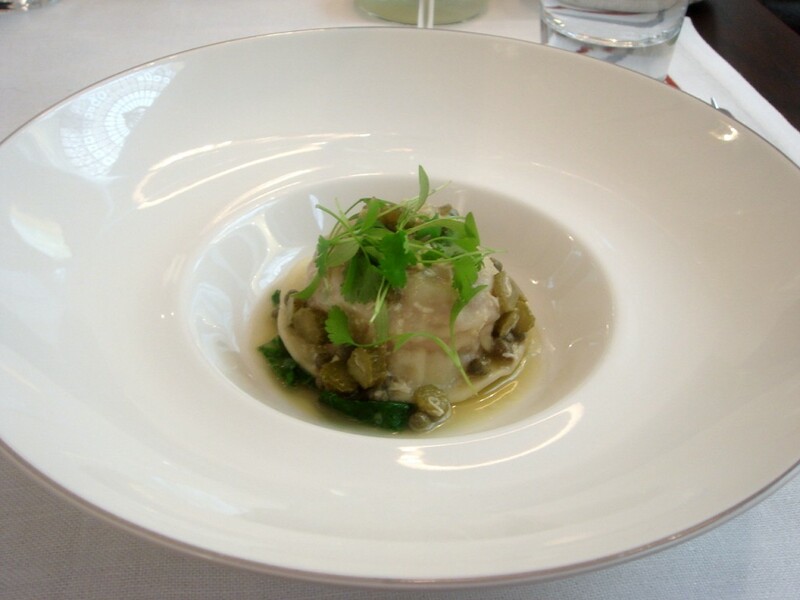 We started with a ham hock ravioli (from Suffolk) served with spring greens and caper vinaigrette. The pasta itself was a little underdone and the combination of the capers with the ham proved a little too salty a combination. 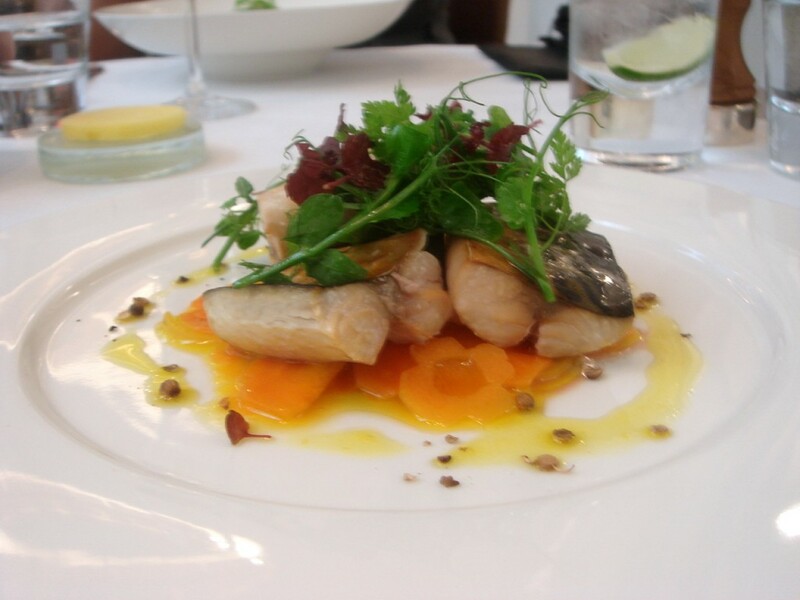 A smoked mackerel (from Dorset) escabeche with a wild herb salad was disappointing. The fish was bland, slightly chewy and lacked any resonance of smokiness. On its own, the fish wasn’t vinegary, but the carrots that made up the rest of the escabeche were, and perhaps overly so. The main dishes fared much better. A braised shoulder of spring lamb (from Elwy Valley) with peas, broad beans and new season garlic was lovely and tender, and nicely balanced by the accompanying sides. 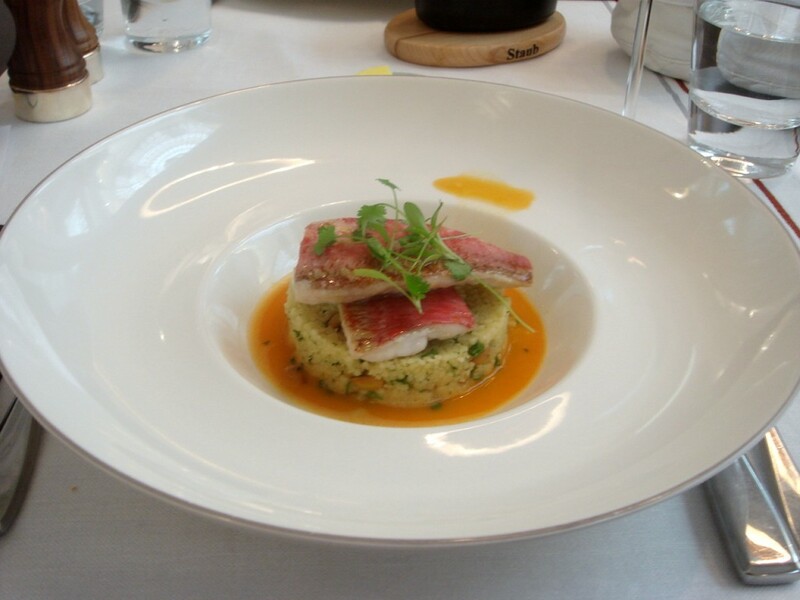 A pan fried red mullet (from the South Coast) was served with lightly spiced couscous and bouillabaisse sauce. The mullet was fresh, although it might have worked better with a crispier skin. The bouillabaisse sauce was lovely and creamy, and a nice addition to boost the flavour of the couscous. However, the sauce, added to the dish at the table, was carelessly poured from too high an angle, resulting in spillage on the rim of the plate. But overall, the dish was very pleasant. 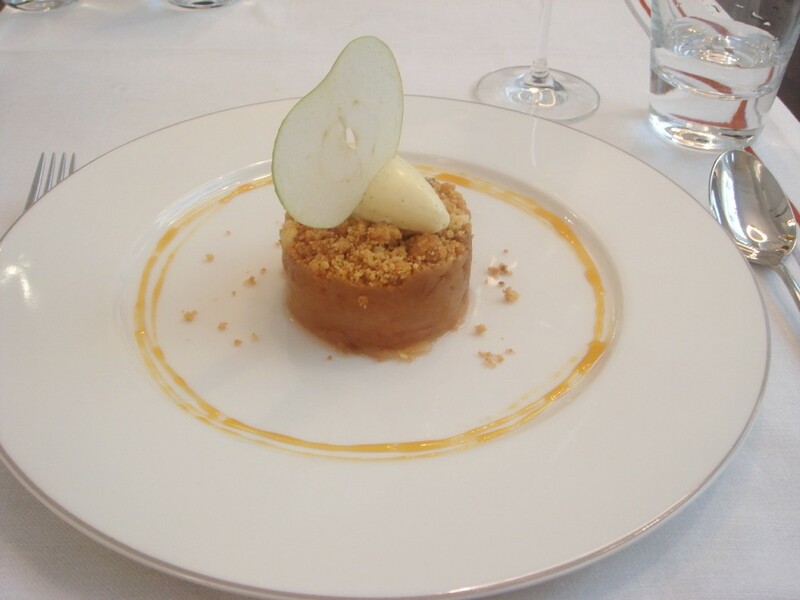 A dessert of slow cooked apple crumble with vanilla ice cream was very tasty, but the apple mixture would have worked better for me with a hotter gooier centre. As for the service, there were mistakes as was evidenced in the mullet dish. Also, more effort could have also been made to top up our water more regularly. But overall, it was very welcoming, and I found that when I requested an extra scoop of ice cream as I tend to do with most desserts, this was brought speedily and that I was not charged for it. There was no doubting the friendliness and charm of the wait staff whom I found to be very pleasant. The food wavered from average (starters) to good (mullet and dessert) to very good (the lamb), and so I would rate it overall as a ‘good’. £25 was a fair enough price to pay for what we had for a lunch menu. The setting is beautiful, the service is friendly, and so its not a bad spot for Liverpool Street. But there were some mistakes, and so if I was to choose from the more expensive `a la carte menu, I would hope the cooking is a little tighter and more consistent, otherwise I might not think that it was worth the extra money. Price – 3 course lunch menu for £25. From the `a la carte menu: starters are £8 to £12; mains are £17 to £22. Excludes drinks and service. The lamb dish sounds really delicious here! I went here when it was Aurora and agree that it is a stunning room. Sounds like it is worth a try in its reincarnation. yes the lamb was really nice. Hi Gourmet Chick, I thought the lunch wasn’t bad overall, seeing as it is only 25pounds. But I hope with the more expensive a la carte that the cooking will be a bit better seeing as its more expensive. Sounds like a fair assessment, and a fair price for the meal. Limp mullet skin doesn’t do it for me, either. And the mackerel sounds distinctly unmemorable. The lamb looks perfect, though, and I guess you can’t go too far wrong with a crumble. Or can you? I enjoyed your thorough review, even though I’ll probably never eat here myself! Andaz sounds like it may have a few wrinkles to smooth out, and hopefully its poorly timed refurbishment won’t hit it too hard. The interior as well as the platings look truly elegant. The environment of the restaurant looks nice, the same goes for the presentation of the food. But don’t think I’ll dine there if the food is not more than good. Hi Sapuche yes probably a few too many wrinkles that need to be sorted out. Sugar Bean, Thanks for coming to my blog. I hope you will come back again. Thanks for the lovely compliment. Yes the food was only a good. I agree, you want the food to be at least a very good.